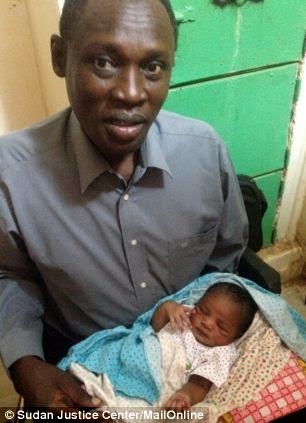 Meriam Ibrahim's case drew furious response from Britain, U.S. and EU. Charges came after she married Catholic U.S. citizen Daniel Wani. She gave birth to a baby daughter just 12 days after she was jailed. Ms Ibrahim was also sentenced to 100 lashes for 'adultery' over her marriage. Lawyer says she has been sent to a safe house for 'protection'. A 27-year-old woman sentenced to death last month for converting from Islam to Christianity in Sudan has been freed from prison and sent to a safe house for her own protection. The case of Meriam Ibrahim, who is married to a Christian American, triggered an international outcry. She gave birth to a baby daughter while in prison. 'The appeal court ordered the release of Mariam Yahya and the cancellation of the (previous) court ruling,' Sudan's SUNA news agency said. The couple's 20-month-old son was also held in prison with Ms Ibrahim and her newborn daughter. MailOnline has led the way in highlighting the plight of Ms Ibrahim, who was sentenced to death on May 15. After international pressure a government official said on May 31 that Sudanese officials were working to release her. She was only finally freed this afternoon. 'Her family had been threatened before and we are worried that someone might try to harm her,' he said. In an interview with CNN earlier this month, Al Samani Al Hadi Mohamed Abdullah said that if Meriam was killed, it would have 'enforced God's word' because she broke sharia. He has threatened to kill her himself if she was not executed. 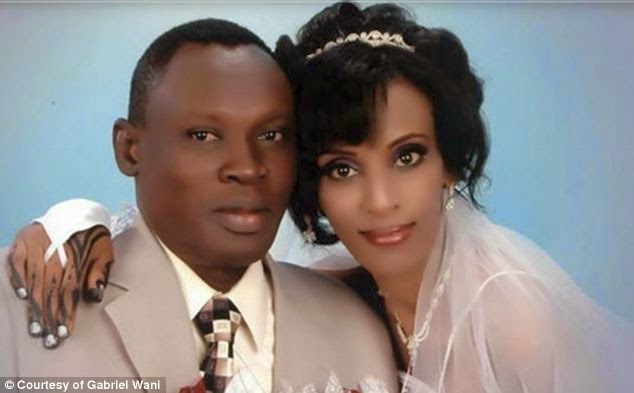 Ms Ibrahim is married to Daniel Wani, an American citizen who is Christian. Safwan Abobaker, an activist who works with religious campaign group Hardwired, which is based in the United States, said that the pressure to release Ms Ibrahim paid off. He said: ‘The Sudanese government was embarrassed by all the attention so they freed her. ‘It’s better for her to come to America now as her half brother said that he would kill her if the court did not carry out the sentence. ‘The Sudanese government needs to protect Meriam and the U.S. embassy in Sudan needs to find a way of bringing her to America quickly. Tine Ramirez of Hardwired added that there will be a meeting on Tuesday between Meriam's lawyers and officials at the U.S. embassy in Sudan to discuss a potential move to America. Senator Roy Blunt, a Missouri Republican, who had written letters to Secretary of State John Kerry demanding action to help free Meriam, welcomed the decision to release her - but called for more action to help her. 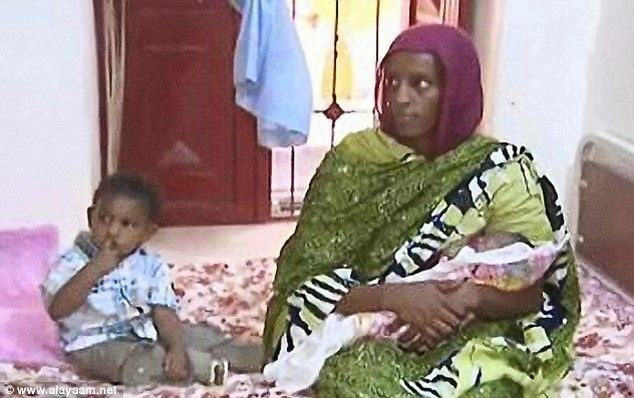 He said: 'I am very pleased that the Sudanese court has reportedly cancelled Meriam Ibrahim’s death sentence and ordered her release. 'I continue to urge U.S. officials to work quickly and use all resources available to immediately provide Meriam and her family with safe haven in the United States'. Juergen Schurr, legal advisor with human rights charity Redress, which has been working with Meriam’s lawyers, said: ‘Until we see the judgement I think we are still a bit cautions because were are very concerned if the government did not address both charges. ‘Meriam was given the death penalty for apostasy and the lashes for adultery. ‘The lashes could still be in place and we are concerned that both charges should be dismissed’. Schurr added that he Meriam had a ‘clear case’ for seeking compensation from the Sudanese government but he has yet to win a payout for anyone he has represented in the country. The Sudanese government also promised once before to release her only to do a U-turn and then leave her in jail for weeks more. As well as the death sentence for apostasy (the crime of abandoning your religion) Ms Ibrahim was also sentenced to 100 lashes for what the court deemed her adultery for marrying a Christian. Born to a Muslim father, she was convicted under Islamic sharia law that has been in force in Sudan since 1983 and outlaws conversions on pain of death. She gave birth just 12 days after the verdict. It had been thought she was still shackled throughout the delivery and beyond, according to the rules which stipulate the treatment of death row inmates in Sudan. But Mohanad Mustafa, one of Ms Ibrahim's lawyers, told AFP last week that jailers removed the chains after she gave birth to her daughter. 'This is on order by the doctor,' he said, adding that he didn't think the shackles would be put back on again. 'After she gave birth the conditions got better,' said Mr Mustafa. 'She has air conditioning. She has a good bed,' he said after he and Ms Ibrahim's Catholic husband, Daniel Wani, visited her. Western governments and human rights groups have pressured the Sudanese to relase Ms Ibrahim. European Union leaders earlier this month called for revocation of the 'inhumane verdict,' while Secretary of State John Kerry urged Khartoum to repeal its laws banning Muslims from converting. Ms Ibrahim, born in eastern Sudan's Gedaref state on November 3, 1987, is the daughter of a Sudanese Muslim father and an Ethiopian Orthodox Christian mother, according to a statement from the Roman Catholic Archdiocese of Khartoum obtained last week by AFP. Her father abandoned the family when she was five, and she was raised according to her mother's faith, it says. 'She has never been a Muslim in her life,' said the statement signed by Father Mussa Timothy Kacho, episcopal vicar for Khartoum. Miss Ibrahim joined the Catholic church shortly before she married the Mr Wani in December 2011, the vicar said. Mr Wani was born in Khartoum but is now a U.S. citizen, the U.S. embassy confirmed to AFP last Tuesday. The case against Ms Ibrahim dates from 2013 when 'a group of men who claim to be Meriam's relatives' filed an initial legal action, the vicar's statement said. In fact, she had never seen those men before, the statement added, in comments confirmed by Mr Mustafa. Ms Ibrahim, who is a trained doctor, and her husband own a barber shop, a mini-mart and an agricultural project in Gedaref, the vicar said. Mr Mustafa did not know if there is a link between the businesses and the case against Ms Ibrahim, but he told AFP: 'Surely there is something behind this'.